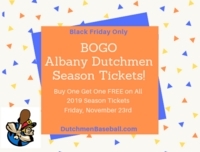 All 2019 Dutchmen season tickets will be Buy One Get One FREE on Friday, November 23rd, 2018 from 12:01AM EST-11:59PM EST. All purchases must be made online through the DutchmenBaseball.com season ticketing page. For questions, please contact Dutchmen VP/GM, Jason Brinkman, at jbrinkma@gmail.com.